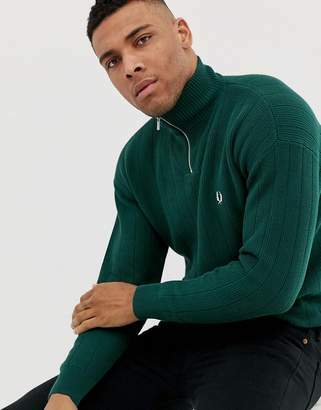 Jumper by Fred Perry, Throw this on when the temperature dips, Funnel neck, Partial zip placket, Embroidered logo to chest, Ribbed trims, Regular fit, No surprises, just a classic cut. Fred Perry's authentic menswear collection is heavily influenced by the brand's historical roots in sport and classic, urban menswear. The range, including the iconic slim fit polo shirt, blends British style with the edge and attitude garnered from the brands unique streetwear credentials.